A bit of a quiet week, this time around. I was up in Scotland over the weekend, so only got the chance to watch a couple of films. Thinking about it, this may be the first week of the year in which I haven't taken a trip out to the cinema - both of the movies I watched this week were on DVD. Kevin Smith's career has taken a bit of a nosedive over the last ten years or so, with the former king of slacker comedy being responsible for quite a few poorly received films, including the likes of Jersey Girl, Cop Out and Clerks II. To be honest, I made a conscious choice not to see any of those films, based on their toxic reputation, but I did see Zack and Miri, which I can personally confirm as being truly awful. Anyway, as a fan of his earlier work, I was lured into watching this one after being told that it was something of a return to form, and to some extent, that's true. Red State sees Smith aiming his sights at both fundamentalist religious fanatics and the US government's heavy-handed tactics in suppressing them. The set-up here has three hormone addled teenage boys subjected to a bait-and-switch trap - they think they're heading for a rendezvous with an older woman, but instead, it becomes apparent that they have been lured into the clutches of a deranged, fire and brimstone preacher. This man, Abin Cooper (Michael Parks) views their kind as endemic of the collapse in moral values in America, and is intent on killing them in front of his congregation as an example to others. At this point, however, the ATF get wind of the murderous activities of Cooper's religious sect, and descend upon the group's compound, all guns blazing. The film is a bit of a departure for Smith - although there are still comedic elements in the mix, it's more of a straight up horror/ action film than anything else. It's also a bit of a mess, with the plot moving rapidly from one story strand to the next at a breakneck pace, with little cohesion or control. Smith seems to have read a few articles in the newspapers on the activities of a certain infamous American religious group from Kansas, combined their story with that of the Waco siege tragedy, had a quick think about his views on both subjects and hoped everything would fall into place. 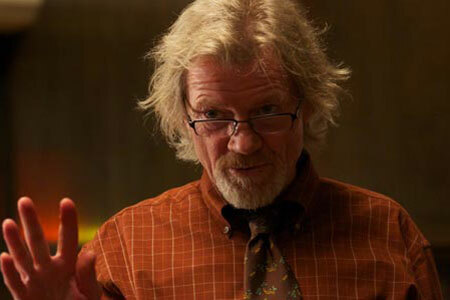 That the film isn't a total disaster is largely down to the efforts of Michael Parks in the central role of Abin Cooper. He gives us a very interesting, unexpected take on what could have been a stock 'crazy preacher' type. He is quiet, avuncular and subtly threatening rather than being an out and out monster - which makes his character's sudden bursts of violence all the more disturbing. While this isn't exactly the return to form I was hoping for, it's far better than Zack and Miri, and with its short running time, it never has the chance to outstay its welcome. This sci-fi/ horror hybrid sees a group of intrepid space travellers sent out to the furthest reaches of the galaxy in search of a missing vessel named the 'Event Horizon'. 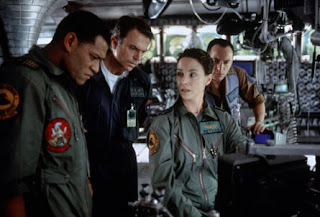 Numbered amongst the ship's crew are the calm, level headed Captain Miller (Laurence Fishburne), troubled scientist Dr William Weir (Sam Neill), mentally exhausted Medical Officer Peters (Kathleen Quinlan) and the amiable if sometimes hot-headed pilot, Smith (Sean Pertwee). Once the missing ship has been located, it soon becomes apparent that something terrible has happened to its former occupants - and that the crew are in grave danger of suffering the same fate... Science fiction movies which purport to show the near future can sometimes get very dated, very quickly, but other than a statement in the opening credits that "by the year 2015, mankind will have established its first colony on the moon", this movie has aged pretty well, at least as far as the visuals are concerned. Director Paul W S Anderson has followed Ridley Scott's approach in Alien and designed his space ships so that they appear realistically grubby and weathered, as would befit a craft that has been active for an extended period of time. There is also a fairly strong cast here, with the likes of Neill, Fishburne and Pertwee making the most of some occasionally clunky dialogue. All in all, I have to say I enjoyed this one, though I did have some reservations, largely stemming from the rather weak ending. Anderson succeeds in building up the tension and paranoia that I can easily imagine would affect individuals stuck in a spacecraft drifting through space; this tension becomes even more palpable as a number of members of the crew experience harrowing and shocking visions, based on their greatest fears and neuroses. Sadly, by the time we get to the climax, and one of the members of the crew is revealed to be the villain of the piece, all subtlety goes out the window, and things come to a rather overwrought and unconvincing finish. With a few changes here and there, this could have been a minor classic. As it is, it's an entertaining, if slightly flawed, picture.